The SEIU and the Center for American Progress Action Fund are teaming up to highlight workers' issues in the first 2020 state with a heavily Latino electorate. 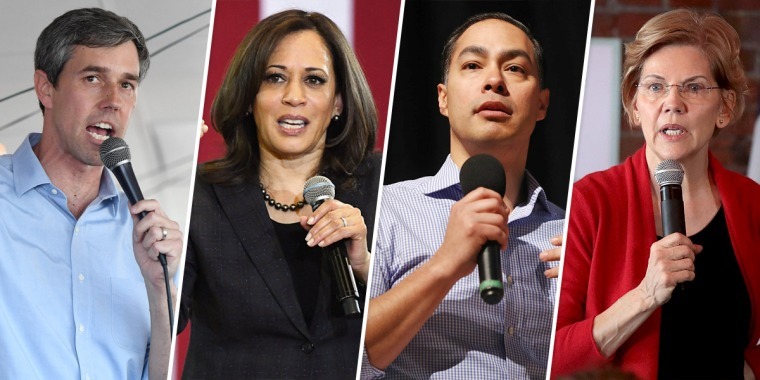 WASHINGTON — At a time when Democratic presidential candidates are firing off proposals designed to send financial boosts to those down the economic ladder, several of them will pitch their plans directly to workers at a high-profile forum in Las Vegas on April 27. Sens. Kamala Harris of California, Elizabeth Warren of Massachusetts, Amy Klobuchar of Minnesota, former Rep. Beto O'Rourke of Texas, and former Housing and Urban Development Secretary Julian Castro have all committed to appear at the National Forum on Wages and Working People, hosted by the Service Employees International Union and the Center for American Progress Action Fund, organizers told NBC. Often overshadowed in the national political discussion by Iowa, New Hampshire and South Carolina, Nevada's caucuses — set for Feb. 22, 2020 — represent the third contest in the Democratic primary nomination race and the first to feature a heavily Latino electorate. That was part of the calculus for locating the economic forum in Las Vegas, said the president of the Center for American Progress, Neera Tanden. "I think we wanted to ensure that there’s two lenses on that issue," she said, pointing to the "diversity" of the progressive movement. "It’s really important that Latinos are represented in that process and obviously the voice of organized labor." Tanden, who worked on Hillary Clinton's 2008 campaign and as a policy adviser in President Barack Obama's White House, noted that the two groups hosted a similar event on health care in 2007 that pushed the primary candidates to hone their plans early in the process. Mary Kay Henry, president of the SEIU, said her union’s members are going to press candidates for specifics. "As SEIU members engage with politicians at all levels of government, we expect them to put forward a robust plan to unrig our economy so black, white and brown working families can thrive, not just billionaires and corporations,” she said in a statement provided to NBC. “The plan must include ensuring the opportunity to join a union, no matter where you work, since that’s the best way to raise wages, improve working conditions, create family-sustaining jobs and begin to fix our rigged economy and democracy,” she said. This year's forum happens against the backdrop of some candidates rolling out policy proposals aimed at empowering workers, from Harris's boost in teacher pay to a series of plans developed by Warren that would, among other things, let laborers elect a large portion of corporate boards and raise estate taxes to subsidize housing for lower-income families. The candidates will be expected to explain their positions on a minimum wage of at least $15 an hour, union membership rights and how various communities can be included in national economic prosperity, organizers said. They will be interviewed by a set of moderators who have yet to be named and asked questions by audience members from SEIU Local 1107 and activists with the group Fight for 15. While SEIU Local 1107 is one of the state's largest unions — boasting 20,000 members — it's smaller than the more famous Culinary Workers Local 226, which has been a driving force in Latino turnout in past Democratic caucuses and general elections.